In Joomla! 1.5.8 and later, a default filtering choice is in place for those who have not selected an Article Filter option. The default applied for those who have not made a selection implements "black list" filtering as a security precaution against possible XSS. In version 1.5.8, all users, including members of the Super Admin group, have this set by default. In versions 1.5.9 and later, users in the Super Admin group do not have any filtering by default. Navigate to Content → Article Manager. Press the Parameters icon in the toolbar to show the Articles - Global Configuration screen. Scroll down to Filtering Options, highlight all Filter groups except Super Administrator, and select Filter type of Blacklist (Default), as shown in the screenshot below. With this setting, Joomla! 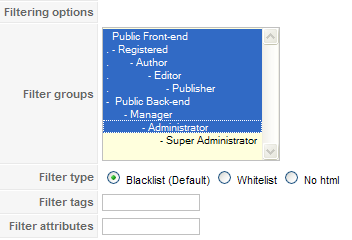 will use the default Blacklist filter for all users except for the Super Administrator group. If you want to let other groups of Users submit content with no filtering, just modify the instructions above to exclude these groups. If you want no filtering on any groups, follow the instructions above but select only the Registered group. More detailed instructions for filtering options can be found by pressing the Help button when in the Article Manager, or here in the Joomla documentation. This page was last modified on 31 January 2011, at 16:47.